Karachi, July 22 : Former Australia captain Ricky Ponting has written the England cricket team Captain off by stating that Alastair Cook will never improve as a player for the rest of his career. According to the Dawn, the backlash comes at a time when the England skipper is already under fire from all sides for his poor form and performance. The loss suffered by England at the hands of India at Lord's on Monday made it the 10th successive test match that the team has lost in the recent times. England cricket team's ten losses are being dubbed as their worst stint in the format in the last 21 years. Sydney, Oct 19 : The Australian media has claimed that former Test captain Ricky Ponting's revelations about current captain Michael Clarke not sticking around for a chat after the day's play on some occasions have pointed out towards the fact that Clarke is not a true captain. According to the Sydney Morning Herald, Ponting's book serves as an informative postscript to an Ashes series in which Clarke was lauded for funky and imaginative field placings, despite losing 3-0. Although Ponting claimed in his book 'At The Close Of Play' that he and Clarke were close friends in 2005 and that he believed Clarke would succeed him as Australian captain, however, that relationship changed when Clarke struck up a relationship with Bingle. Sydney, Oct 12 : Australian cricketer Ricky Ponting is soon going to release his memoirs in a publication titled ' At the Close of Play'. According to News. com. au, as a cricketer, Ponting always seemed more adept at deflection than reflection and he was direct, honest and straightforward, but not one to dwell on the past. Will it be the year of Mumbai Indians? New Delhi, April 2 : Despite being one of the top-spenders and having one of the best teams, Mumbai Indians are yet to win the Indian Premier League (IPL). After two poor seasons in the beginning, the team showed their true skills only in the third edition in 2010 when they reached the final before losing to Chennai Super Kings. Hobart (Australia), March 20 : Former Australian captain Ricky Ponting Wednesday collected the Sheffield Shield player of the year award and ruled out an international comeback for the Ashes cricket series in England. Ponting, 38, who will be in England playing for Surrey at the same time when the Australian teams attempt to regain the Ashes, said an international comeback was out of question for him. Sydney, March 15 : Former Australia captain Ricky Ponting has lent his support to under-fire vice-captain Shane Watson, saying he backs Shane's decision to return home at the time of the birth of his first child. Watson was barred by team management from taking part in the third Test against India in Mohali along with three other cricketers for disciplinary reasons. The all-rounder flew back home to be by the side of his wife Lee Furlong. The couple announced Thursday the birth of their son Will. Sydney, Feb 6 : Australian legend Ricky Ponting and Indian batting great Sachin Tendulkar have already started planning Mumbai Indians’ strategy in the upcoming Indian Premier League (IPL) season through text messages. 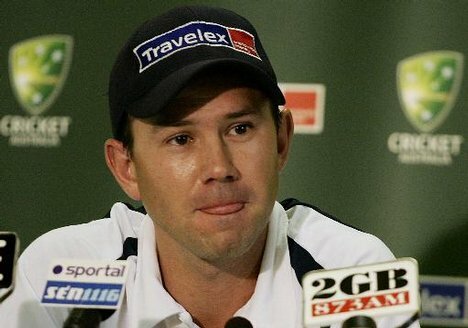 Ponting was picked up by Tendulkar''s franchise for 400,000 dollars in the IPL auction last week, the Age reports. It caused one Indian media outlet to describe the pair playing together, and possibly opening the innings, as an unprecedented miracle. Sydney, Jan 11 : Retired Australian legend Ricky Ponting will lead the Prime Minister''s XI during its one-day clash against West Indies later this month. Ponting will captain the side at Manuka Oval in Canberra on January 29, while former Test keeper Brad Haddin will be the vice-captain, News. com. au reports. Minister for Sport Kate Lundy disclosed the full team line-up on Friday on behalf of the Prime Minister Julia Gillard. Sydney, Dec 27 : Former Australia Test captain Ricky Ponting has slammed critics of the controversial rotation policy for fast bowlers, saying they have no idea what kind of workload young fast bowlers have on their heads. Ponting said he is annoyed with the critics, who without much knowledge about the game's current scenario, keeps talking about the rotation policy, the Sydney Morning Herald reports. Ponting said everyone around the Australia cricket set up is trying to help the game in any possible way. Sydney, Sept 8 : Former Australian cricket captain Ricky Ponting and wife Rianna has been blessed with a second baby daughter, whom they have named Matisse Ellie. Ponting flew home from the tour of Sri Lanka to be present for the birth of their second daughter, telegraph. com. au reports. The Pontings have a three-year-old daughter, Emmy. It is expected that Ponting will return to Sri Lanka for the third and final Test, which is scheduled to begin on September 16 in Colombo. Colombo, Aug 31: Ricky Ponting will become the first cricketer to play in 100 winning Test matches if Australia wins the ongoing Galle Test against Sri Lanka. Ponting already has the records of more Test and one-day victories as captain. Not surprisingly, the top eight players on the list of Test victories are Australians, the Courier Mail reports. Colombo, Aug 30: Australian batsman Ricky Ponting has a simple piece of advice to his teammates preparing to bat in the first Test against Sri Lanka - get your starts right and you'll be fine. Ponting reckons that if batsmen can get through their first 20 deliveries they can succeed in the island nation. Colombo, Aug 6: India's tour of Australia will be the toughest for the Michael Clarke-led team this year, according to Ricky Ponting. Australia have tours of Sri Lanka, South Africa and New Zealand before they face India in December, but the former captain said that Australia-India series have always been one of cricket's biggest and most volatile clashes. IPL boss Lalit Modi, a day before accused the Australian captain Ricky Ponting of interfering in the Australian players' decision of participating in the IPL over the security issue. He slammed Ponting and further warned the players that this kind of behavior would not be acceptable and they could not go about dictating terms as per their choice. Ricky Ponting's contract with KKR was terminated this season. Its IPL making the news again. In the country of cricket fans, IPL has emerged as a major event in the country and during the past two events, the impact was phenomenal. IPL is always in the news for reasons, right and wrong. There were reports that suggested that Australian captain Ricky Ponting has been advising his teammates to back off from the IPL. Australian cricket is in great shape ahead of their next two major assignments, winning back the Ashes and chasing a fourth-straight World Cup triumph, said Captain Ricky Ponting. The Sydney Morning Herald quoted Ponting, as saying," We''re heading in the right direction in all forms of the game and with the exposure that we''ve been able to give a lot of the younger guys as well, a lot of them aren''t so young any more in terms of having games of cricket under their belts." Melbourne, Feb 7: Australian skipper Ricky Ponting has backed his fast bowlers to contain West Indies captain Chris Gayle and his team in the one-day series starting at the MCG from Sunday. Ponting also claimed to have assembled the best fast-bowling group in the world after the West Indies captain coolly tipped his team to thump Australia in the series. Gayle has predicted said that the West Indies would win the series 4-1 despite Australia taking a stranglehold on the 50-over format in recent months and the Calypso outfit being weakened by injuries to experienced players.